Simple yet fresh very fragrant flavours, this is a comfort food. You can prepare each part in your kitchen or even buy ready to eat smoked duck breast. Using egg noodles is my favourite but any kind of noodles, rice vermicelli and even pasta could work well. The clean light flavours of the sauce should leave your palate pleased! Wash and score 4 duck breasts. Making sure only the fat is scored and not the actually meat. Rub in some salt gently massaging it. You may roast, grill or sear the duck breasts in the following ways. Preheat the oven to 350F/180C and cook on the fat side up, for 30 minutes until golden brown. Testing it with a wooden skewer ensures the duck is cooked. If grilling cook duck on fat side down for 10 minutes, on a medium flame, and then turn it around for another 7 minutes. If searing in a pan, no oil is necessary. Heat the pan and sear fat side down for 10 minutes on a medium flame and then on the other side for another 7 minutes. For any of the methods after cooking it, remove and allow it to rest for 10 minutes. Slice and add to the sauce to infuse for 4 hours and up to 48 hours. This is best served with egg noodles ( or any noodles) that have been cooked as per instructions. Drain the water, and pour all the coconut sauce over. Submerge all the noodles properly allowing the sliced duck to sit over it. Cover and infuse for 20 minutes. Gently reheat and serve immediately. While the sauce is meant to be thin, the starch from the noodles will help thicken it. If you prefer it to "coat the back of your spoon", mix until smooth 2 tsp of cornstarch in a bowl with tap water and add it to the sauce. Allow it to boil for a minute and it will be ready. The combination of the above ingredients is now available in boxes called Aromatic Thai Fragrant Spices. If using the prepared dry spices add 4 tbsp for this quantity. However you will still need to add fresh or dry Kaffir Lime leaves and an inch of fresh ginger when you add the noodles to infuse for a perfect finish. While boiling the noodles add a stalk of lemon grass, fresh grated lemon peel, salt and oil. This give the noodles a wonderful burst of flavour. If you prefer to serve this with sticky coconut rice; you may need to thicken the sauce by boiling it further to reduce the liquid. Other noodles you may like to try are udon, soba, quinoa or rice vermicelli. 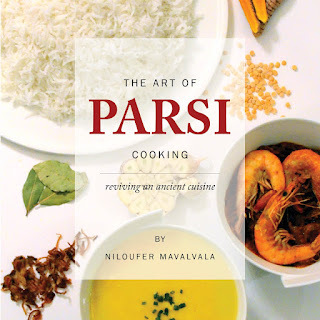 For recipes on Parsi Food read my cookbook The Art of Parsi Cooking; reviving an ancient cuisine. Nerina Shroff Thanks Niloufer Mavalvala. Made this for dinner tonight. Turned out yum.